Considered the father of Indian space program; instrumental in establishing the Physical Research Laboratory (PRL) in Ahmedabad in November, 1947; was Chairman of the Atomic Energy Commission. He along with other Ahmedabad-based industrialists played a major role in the creation of the Indian Institute of Management, Ahemedabad. 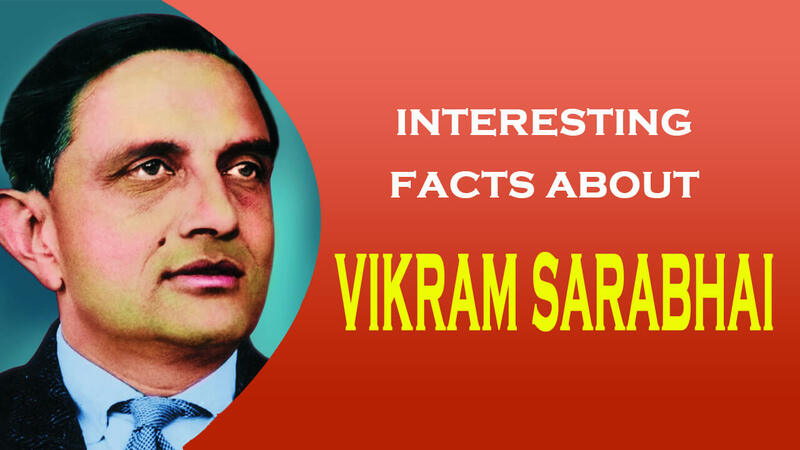 Vikram Sarabhai was one of the greatest scientists of India. He is considered as the Father of the Indian space program. Apart from being a scientists, he was a rare combination of an innovator, industrialist and visionary. Vikram Ambalal Sarabhai was born on August 12, 1919 at Ahmedabad in an affluent family of progressive industrialists. He was one of eight children of Ambalal and Sarla Devi. He had his early education in a private school, “Retreat” run by his parents on Montessori lines. Some of the great men of India such as Gurudev Rabindranath, J. Krishna Murthi, Motilal Nehru, V.S. Shrinivasa Shastri, Jawaharlal Nehru, Sarojini Naidu, Maulana Azad, C.F. Andrews, C.V. Raman etc., all used to stay with the Sarabhai family when they visited Ahmedabad. Mahatma Gandhi also once stayed at their house while recovering from an illness. After his matriculation, Vikram Sarabhai proceeded to Cambridge for his college education and took the tripods degree from St. John’s college in 1940. When world war II began, he returned home and joined as a research scholar under Sir C.V. Raman at the Indian Institute of Science, Bangalore His interest in solar physics and cosmic ray led him to set up many observation stations around the country. He built the necessary equipment with which he took measurements at Bangalore, Poona and the Himalayas. He returned to Cambridge in 1945 and completed his Ph.D. in 1947. Vikram Sarabhai was instrumental in establishing the Physical Research Laboratory (PRL) in Ahmedabad in November, 1947. Which was founded by his parents. Subsequently, it got support from the Council of Scientific and Industrial Research (CSIR) and the Department of Atomic Energy. Vikram Sarabhai did research on the time variations of cosmic rays and concluded that meteorological effects could not entirely affect the observed daily variations of cosmic rays. Vikram Sarabhai visualized a new field of research opening up in solar and interplanetary Physics. The year 1957 – 1958 was designated as International Geo physical year (IGY). The Indian program for the IGY had been one of the most significant ventures of Sarabhai. It exposed him to the new vistas of space science with the launching in 1957 of Sputnik-I. Subsequently, the Indian National Committee for Space Research was created, of which Vikram Sarabhai became Chairman. With active support from Homi Bhabha, Vikram Sarabhai, set up the first Rocket Launching station (TERLS) in the country at Thumba near Thirvananthapuram on the Arabian Coast, as Thumba is very close to the Equator. The first rocket with sodium vapour payload was launched on November 21, 1963. In 1965, the UN General Assembly gave recognition to TERLS as an international facility. After the sudden death of Homi Bhaba in an air crash, Vikram Sarabhai was appointed Chairman, Atomic Energy Commission in May, 1966. He wanted the practical application of science to reach the common man. He decided to acquire competence in advance technology for the solution of country’s problems based on technical and economic evaluation of its real sources. He initiated India’s space programme, which today is renowned all over the world. Dr. Vikram Sarabhai was awarded with Shanti Swarup Bhatnagar Medal in 1962 and Padma Bhusan in 1966. Vikram Sarabhai passed away in his sleep on December 31, 1971.